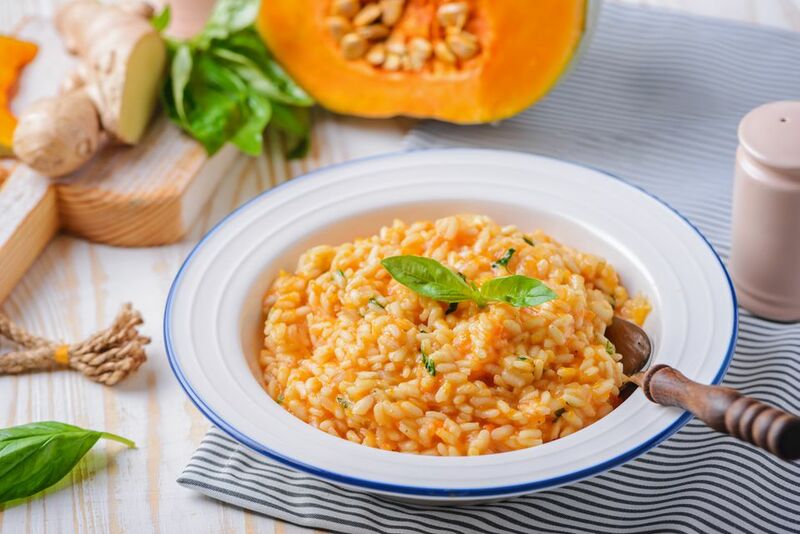 A vegetarian and vegan twist on classic Italian risotto, made with pumpkin! The squash adds a sweet and unique flavor perfect for fall, as a vegetarian Thanksgiving entree, or really, anytime. Whether or not you're actually vegetarian or vegan, pumpkin risotto is a delicious, unique and creative entree choice for a fall, Halloween or Thanksgiving meal. It's also a great way to use up any leftover pumpkin you might happen to have on hand from the holidays. This Italian risotto recipe is both vegetarian and vegan, as long as you use a vegan margarine instead of butter. If you need it to be gluten-free as well, just be sure that the vegetable broth that you use is gluten-free, since all the other ingredients, including the rice, white wine, pumpkin and seasonings, are all gluten-free. Saute the onions in the olive oil over medium heat for about 3 to 5 minutes, or until the onion is mostly soft. Next, add in the rice. Allow to cook, stirring, for a minute or two, just to lightly toast the rice, and being carefully that it doesn't burn. Slowly add in the white wine. Start to add the vegetable broth, 1/2 cup at a time. Allow the moisture to cook off before adding the next 1/2 cup. Stir frequently, and continue adding the vegetable broth 1/2 cup at a time. Many chefs advise keeping the vegetable broth heating on the stove so that it is already simmering and hot when you add it to the rice. Once you've added all the vegetable broth and the rice is nearly cooked, add in the pumpkin, fresh ginger, nutmeg, fresh basil and vegan margarine or butter. Stir well to combine everything well, and season lightly with a bit of salt and pepper, to taste. All everything to heat, just for another minute or two, until everything is thoroughly heated through, and stirring frequently.